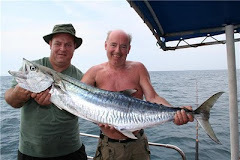 Together with friends from TDSAC we had a nice fishing trip last Saturday the 22.10.2011. 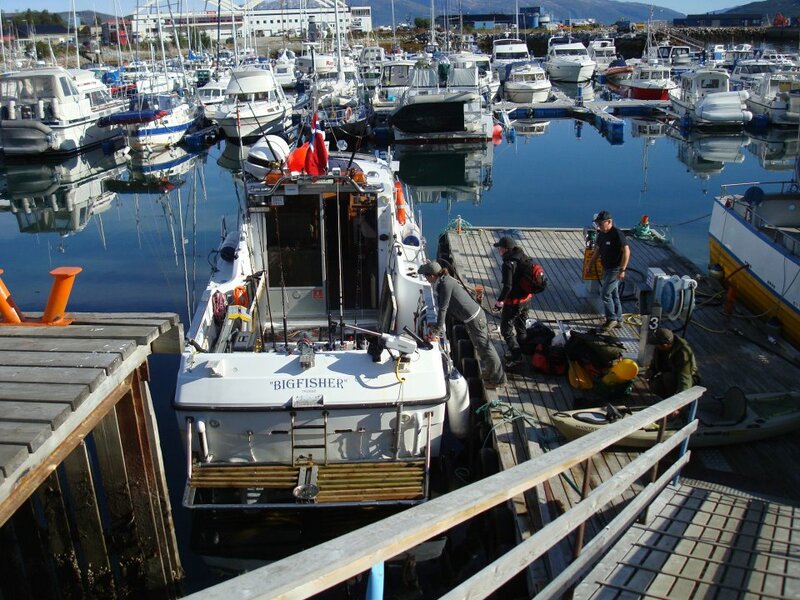 In a beautiful weather we started onboard M/V "BigFisher" from Skattøra Marina early in the morning. Beautiful day onboard the "BigFisher"
Onboard the "Bigfisher" we landed two Halibuts - one small and one beauty at 138 cm / 30,6 kg - nice catch by Kim - the " halibut Expert "!! For me it was not the last trip this year - next week I will go hunting the BIG ones for THREE DAYS together with good angling friends. STORMFISH ON M/V " BigFisher"
This weekend we had heavy rain and stormy weather from west and south-west - and the planned clubtrip with the Tromsø Deep Sea Angling Club had to be cancelled due to the bad weather. 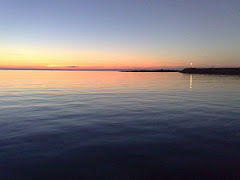 We tried in the opening of Kvalsund outside Seiholla without luck, and decided to try Skagøysund. It was some wind - but not too bad for the BigFisher. 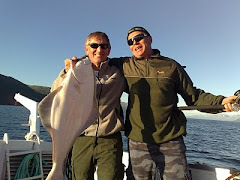 Henrik lost a nice Halibut there, and when it was getting dark the wind from west increased and instead of doing a very inconvenient trip against the waves back to Kvalsund we went north and found shelter for the night in Vargsundet beetween Rebenessøy and Hersøy. During the night we had heavy rain and gale conditions. Sunday morning we went out to Grøtøysund to check the conditions. It was heavy wind and rain, but inspite of this we had a rough and wonderful day of fishing out there. 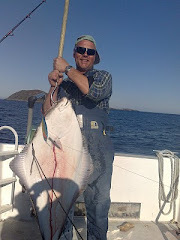 After a nice drill I caught a 120 cm halibut , and Henrik hooked a big one that broke his strong line after a short fight. Possibly this was a 100 + fish that we have been hunting for out here. 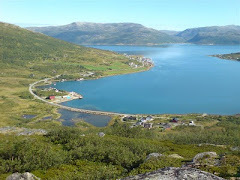 To avoid the bad weather from west we went north of Ringvassøy and through Langsund to get back to Tromsø. In Tromsø the weather was nice and calm with temperature of 9 degrees C- not bad in the middle of October. The weather forecast is no good this weekend - rain, strong winds from southwest and heavy rain. 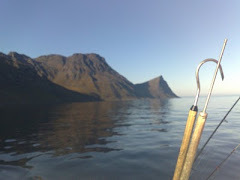 But still I believe it is possible to go fishing in the more sheltered areas around Kvaløyvågen. Maybe the halibuts enjoy bad weather !!! 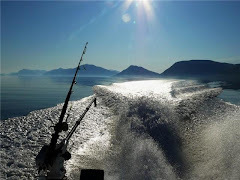 Look forward to an exciting weekend on M/V "BigFisher"
Fishin' is the mission !! Hav og Fjell and Nordic Sea Angling Fishing-Guide Burkhard Plichta lost his life in a tragic car-accident the 7.th of October 2010 . Today - one year after the accident I still remember your friendly smile and miss our good friendship very much. We had many good fishing experiences together. 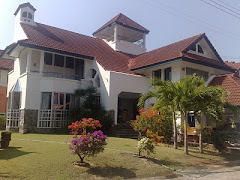 Sooner or later we meet again ! Rest in peace-dear friend ! Made a nice trip yesterday on M/V "BigFisher" together with Sunny and Henrik outside Rebbenesøy. Beautiful weather during the day - rain and some shifting winds in the afternoon. It's nice to watch the incredible wild nature at this time of the year - earlier this week it was heavy storms out there. 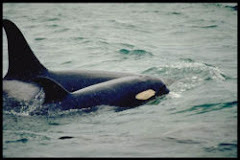 Two of them had to follow us back home for dinner- sorry friends - no Catch and Release today !! My eagle-friends were watching us - it's always good to visit your beautiful environment. October is still a virgin - and it's still time for more adventures out there !! Still time to go ! !